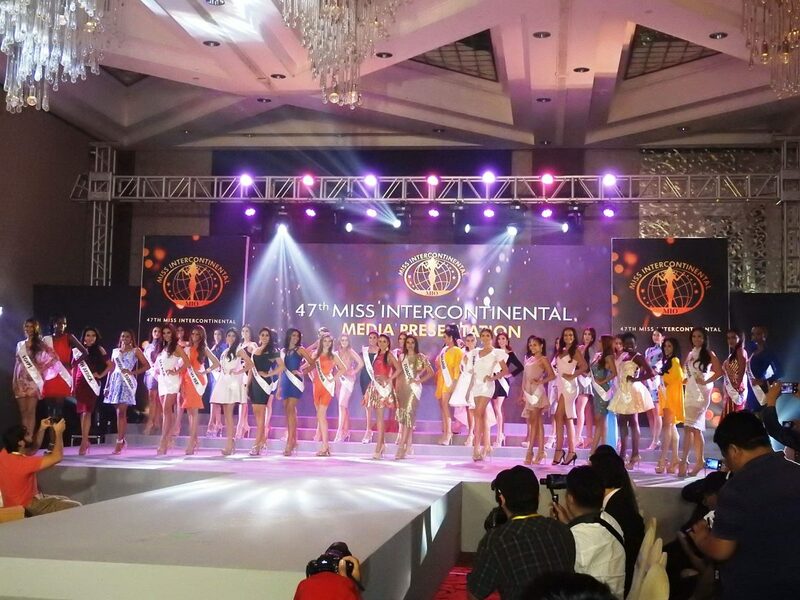 The Philippines welcomed the gorgeous eighty-seven (87) candidates of the 47th Miss Intercontinental (2018) to be held at various locations, including Manila, from January 8 to 27, 2019. It is the first time that Philippines is hosting this pageant. Miss Intercontinental-Philippines Karen Gallman won two special awards, namely: Miss H&H Standout Beauty and Media Favorite Awards at the Press Presentation held last January 10 at the Mindanao Ballroom of Sofitel Philippine Plaza Hotel, which is also the official residence of the candidates. The Coronation Night will be held on January 26, 2019 (Saturday). The H&H Standout Beauty Award gave away $1000 cash prize. Local and foreign media friends who covered the press presentation cast their votes after the candidates strutted it out on the ramp that determined the Media Favorite Award. Miss Intercontinental 2017 Veronica Salas Vallejo (Mexico) will crown her new succesor on January 26. For the past 46 years, two countries have won won the title of Miss Intercontinental five times: Venezuela (1974, 2001, 2005, 2009, 2012), and USA (1973, 1979, 1982, 1994, 2011). Four countries have won three times namely: Puerto Rico (1986, 2010, 2016), Russia (1991, 2013, 2015), Germany (1992, 1993, 2000), and Brazil (1972, 1981, 1998). The subsidiary award of Continental Queens was first introduced in 2008, where 5 of these titles are being given each year (1 per continent) that make up the Top 5 Finalists. Christi Lynn McGarry (Philippines) won Miss Intercontinental Asia & Oceana in 2010 & 2015. Other Filipino candidates also won Miss Asia Intercontinental: Andrea Koreen Medina (2013), Kris Tiffany Janson (2014), and Katarina Rodiguez (2017). So far, the countries who have won the most number of Continental Queen awards were Venezuela, Puerto Rico and the Philippines, each has won five times. In 2010, McGarry originally won the title, Mutya ng Pilipinas-Asia Pacific. She then replaced Carla Jenina Lizardo, who originally won Mutya ng Pilipinas-Intercontinental, due to a family emergency. After some years, the Miss Intercontinental franchise was acquired by Binibining Pilipinas. When McGarry competed in Binibining Pilipinas in 2015, it was a coincidence that she won the title of Binibining Pilipinas-Intercontinental, that is why she represented the Philippines again in the same pageant. The rumors of switching places in 2015 did not push through. January 16, 2019 (Wednesday) - The Swimsuit and Philippine Designers’ Evening Gown Fashion Show at the Grand Ballroom of Okada. January 17, 2019 (Thursday) – Evening Gown Competition and Philippine Designers’ Filipiniana Fashion Show at the Grand Ballroom of Okada. January 19, 2019 (Saturday) – National Costume Competition at the Garden of Okada. The Final Pageant and Coronation Night is on January 26, 2019 (Saturday) at the SM Mall of Asia Arena in Pasay City. Tickets for the preliminary shows and the final pageant and coronation night are on sale.